This plugin integrates Gravity Forms with the Affiliates Enterprise plugin. Both of them should be installed and activated on your WordPress site. See the requirements and features based on Gravity Forms Add-Ons below for more details. Sign up new users as affiliates when they register through a user registration form handled by Gravity Forms’ User Registration Add-On. After the extension has been activated, a new Affiliates section is available in the Form Settings tab of each form. 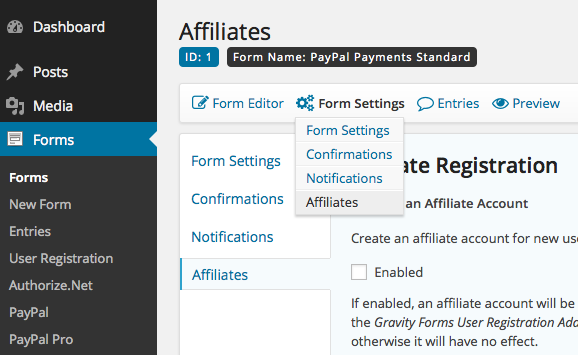 This section explains how to automatically create an affiliate account for a new user who registers via a form controlled by Gravity Forms. 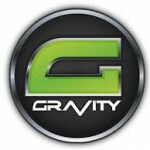 You must have the User Registration Add-On for Gravity Forms installed and activated. Go to Forms > New Form to create a new form, add a Name and an Email field to the form. While editing the form, go to Form Settings > Affiliates and in the Affiliates Registration section, check Enabled for the Register an Affiliate Account setting and hit the Save button. Go to Forms > User Registration to add the form. Now you can use the form on your site and when a new user registers, an affiliate account is created and associated with the user account. Existing forms can have affiliate registration enabled as well, as long as they are enabled for user registration and the appropriate adjustments are made as explained above. Affiliates who refer visitors to your site can be credited with referrals that are recorded when the visitor submits a form that is managed by Gravity Forms on your site. Referrals can also be recorded through Coupons if Gravity Forms Coupons Add-on is installed and activated. Referrals will be recorded on form submissions where a valid coupon is used. The referral will be granted to the affiliate who has this coupon code as attribute. Such referrals can simply be recorded so that you know who was referred by whom, or you can also grant a commission (referral amount) to the affiliate. Such referral amounts can be fixed or based on payment or order amounts related to a form. To enable referral recording for a form, go to Forms and edit the desired form, under Form Settings > Affiliates > Referral Settings check Enabled and hit the Save button. Review the settings and indications related to the Referral Amount, Referral Rate and the Referral Base Amount. Make appropriate adjustments and test your forms after visiting a test affiliate’s link. A form that provides a payment or order amount will result in a referral amount calculated based on the referral rate. This is overridden if an amount is set explicitly here. Form submissions without payment or order amounts can still create referrals with an amount if the amount has been specified here. The referral rate is used to calculate the referral amount based on the form’s payment or order amount. 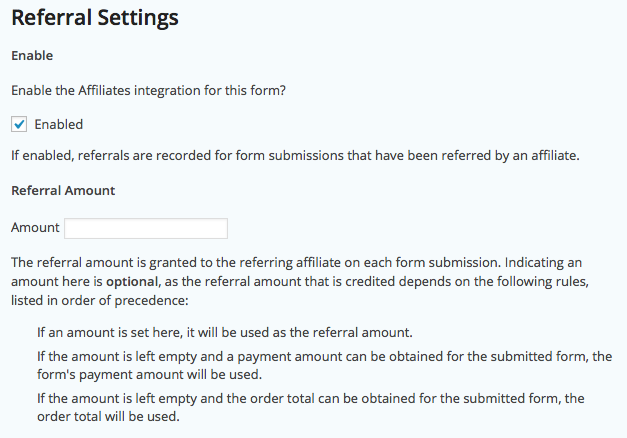 For example, if you want to grant 20% commissions on payments made through your form, indicate 0.2 as the referral rate. The referral rate will also apply if an amount has been set here. If you are using Affiliates Enterprise, the Base Amount option can be enabled to apply the general rate or specific rates for affiliates. Add a product field to your form, we will assume that this field has Field ID 1, it’s Field Type is Single Product, it has a price and the quantity field is enabled. Optionally add a Shipping field. It is recommended to set the default referral status to Pending (under Affiliates > Settings). The referral status will be updated automatically depending on the payment Add-On that is used with the form. PayPal / Stripe Mark referrals as accepted after payment. Update referral status according to payment status, payment refunds mark referrals as rejected. Referral status updates for the PayPal Pro Add-On are supported, this is not supported for the PayPal Payments Pro Add-On. Subscriptions are supported to a limited extent. No referrals are recorded for recurring payments. 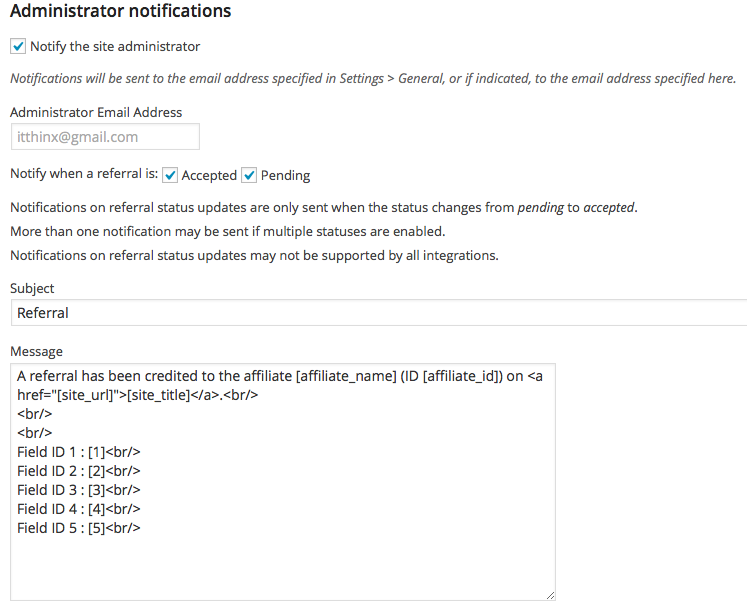 With Affiliates Enterprise, notification tokens can be used to include submitted form data in the notification emails. Each field in Gravity Forms has an integer ID (1, 2, 3 …) which is used to insert the field’s value or values submitted through the form.